Megan Grumbling won the 2015 Vassar Miller Prize in Poetry for her book about Bernard A. Booker, the unofficial mayor of Ell Pond in rural Maine. Booker died in 2008, but the book resurrects him in poems that create a portrait of a self-reliant, resourceful old man of the woods. With an arresting combination of precise observation and rural language, Booker’s Point captures a way of life that is not so common anymore. Just perusing the titles of the poems in the book, one gets a feeling for the man’s personality and interests: “Plucked,” “Stone Harvest,” “Making It Home,” “Birches,” “Rock Maple Sap,” “Trout Tenets,” “Practical Jokes,” “Hemlock,” “Blueberrying,” “Good Digging,” “Moosemeat,” “Tamaracks,” “Trouble,” “Beeches,” “Water Lines: Reckoning,” and “True North” are among the titles. you’ve gotta cross that river on them wires. The poems in this book are neither obscure nor erudite; instead, they match the subject matter in their colloquial liveliness. A look at some of the verbs in the poem “Tacks,” which compares the narrator’s graceless sailing runs in Ell Pond with Booker’s expertise, shows the feistiness of the work. A glance at the verbs in this poem reveals: seized, lurched, luffed, blundered, stooged, heave, clenched, swooped and goose. These poems do not sit still. Bernard Booker’s ingenuity and resourcefulness are made evident in poem after poem. In “Making It Home,” we learn the origin of many of the materials that make up his home: the granite slabs he dug up, and the stones he’s used in his fireplace, unearthed while he was working at putting in phone lines, each with its own story. And we learn of the nearby places that have given Booker such raw materials: Whippoorwill Swamp, Cabbage Hill near Shaker Cemetery, Canal Street, the old mill . . .
in slumber, quartzdream, humus, nodding off. the granite rests, lulls a weight of this place. The very rhythms of the poem make one want to slow down and look around, live more closely in alignment with the earth’s slow changes—something that seems so hard to do in this hurried, complicated, mostly manmade world of ours. that hold the letters right, the symbols clear. when all the other broadleaves have gone stark. to carve ourselves an emblem, a return. 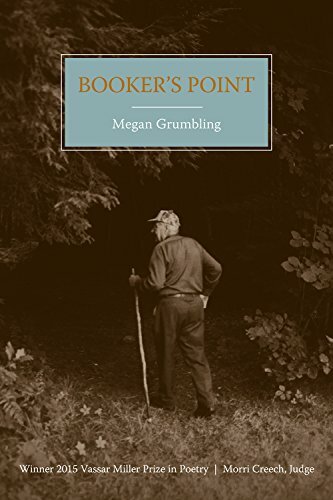 Megan Grumbling’s closely observed, lyrical poems give us a fine portrait of rural Maine and of one man whose life was so intertwined with the area around Ell Pond, it is hard to imagine how he could ever have lived anywhere else. Ginny Lowe Connors is Publisher at Grayson Books, an independent poetry press. She is also an award-winning poet whose most recent collection is The Unparalleled Beauty of a Crooked Line.